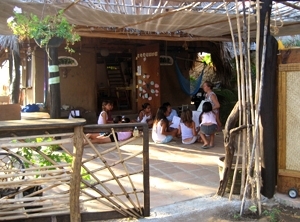 La Escuelita, or "The Little School", began on the back streets of a small village on the Pacific coast of Mexico. English classes were given under an old grass-roofed structure using makeshift benches and a loaned table. A desire to learn was seen from both the children and adults; their eagerness and joy towards learning was inspirational. The dream of a complementary educational centre for the community was born. In 2OO5 land was bought and La Escuelita built. The dream began many years ago and much love and energy has been dedicated to making it a reality. It is only missing one thing: your help. In order for centre to have the capability to survive and grow, we need help; be it financial, your time, donation of materials or simply just passing on the word.